I missed the actual conjunction on October 26 due to bad weather. On this day at 14:00 UT, Venus would have been 0.6% illuminated, with 6° 15′ elongation to the Sun. But this hasn’t been my most extreme Venus crescent so far. The trick is to hunt down the planet exactly on conjunction day. During almost all inferior conjunctions, Venus is passing at an angular distance from the Sun – either to the north or south. This can be as much as 8° 50′ from the Sun’s center. As it is more easy (and safe) to observe Venus when it is farther from the Sun, the crescent is still comparatively “thick” during such a wide conjunction. To hunt for extreme crescents, it’s better to wait for closer conjunctions – and pin down Venus exactly on conjunction day. I managed to do this on January 11, 2014. Venus was 5.1° away from the Sun on this day. Illumination was 0.4%. The view was spectacular, but contrast was rather low. But Venus can get even thinner than that. 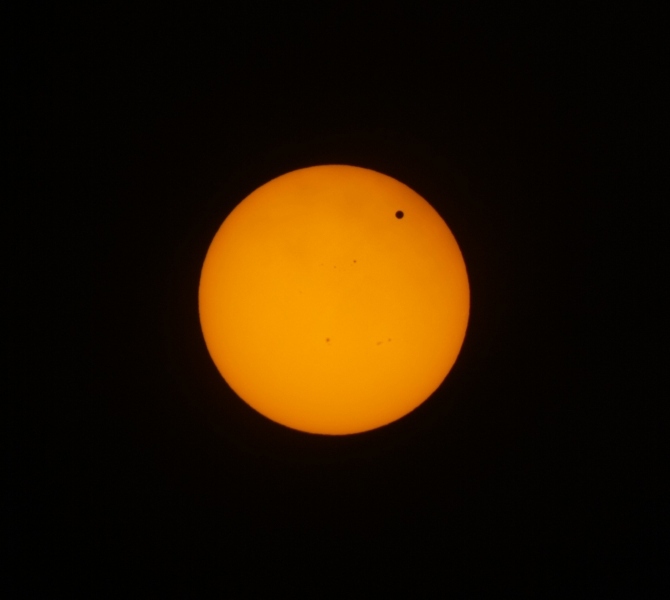 The closest Venus can get to the Sun – is during a Venus transit. This is the very rare case of an inferior conjunction, when Venus is less than 0° 15′ distant from the Sun’s center and passing right in front of it. It is also a great opportunity to observe a very thin crescent of Venus in the time preceding and following the event. During the last transit on June 6, 2012, I travelled to northern Scandinavia to witness the event. Up here, the full event was visible, as the Sun did not set. This special setting also enabled me with very favourable geometric conditions to hunt down Venus in the days before the transit. Indeed, I tried every evening to glimpse Venus, and the last time I succeeded was on June 4, just 28 hours prior to the onset of the transit. Venus was only 2.2° from the Sun. Illumination was 0.1%. Wow! This is my record so far. Unless you count the illuminated atmospheric rim at first contact during the Venus transit as an even more extreme crescent. All these observations require a telescope – and a lot of caution! The Sun is always near, and making a mistake can cost your eyesight. So here are some tips to enhance safety and get the best results. Avoid the possibility to look into the Sun at all. This is simple: Place your scope in the Sun’s shadow. This is best done when the Sun is low in the sky – as it had been in the evenings prior to the transit in 2012. Use the shadow of a house or wall, and place the telescope in a manner that the shadow will gradually cover more ground of the place where you stand. Looking through the telescope, you’ll not need to worry that the Sun suddenly comes into view. Reset the telescopes every 5 or 10 minutes or so. This technique is especially useful for elongations of less than 5°. But it only works in the days before inferior conjunction, when Venus is following the Sun on its daily motion. Do not do this after conjunction! This image from June 4, 2012, illustrates my safe method observing Venus very close to the Sun. The telescope is positioned in the shadow of a house. The movement of the Sun will prevent it from entering the field of view unintentionally. 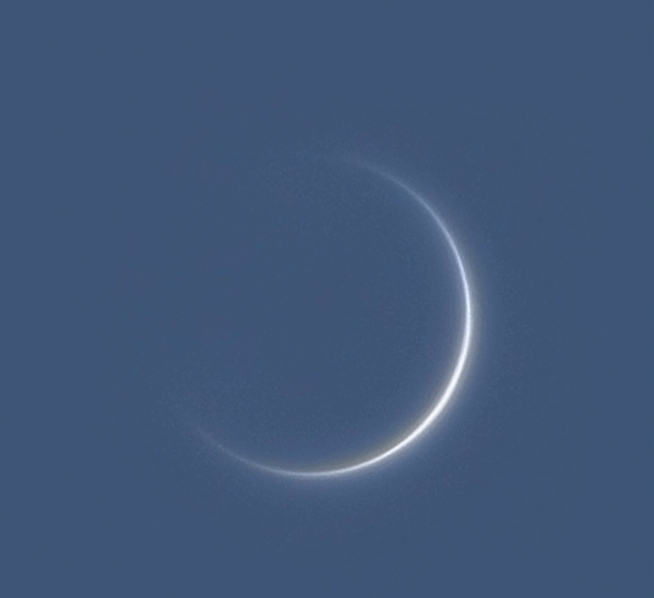 For elongations of more than 5°, as in October, you can use setting circles or a computerized mount to look for Venus in broad daylight. I used a Zeiss Jena TM mount, which can be aligned during the day if you know the latitude of the Sun. Once the Sun is centered (with filter in place!!) and the right ascension setting adjusted, Venus can be positioned just by setting the circles to that day’s coordinates of Venus. Before taking a look through the eyepiece, look at the bright exit pupil from some distance to rule out the Sun shines into the telescope accidentally. Do not use a wide angle eyepiece. I would recommend a classic Ortho eyepiece with 40° or 45° fov. The resulting true field should not be larger than 1°. Use medium magnification. With very low powers (<15×), Venus is too small and contrast is too low. With high powers (>50×), the field is too small and contast again too low. 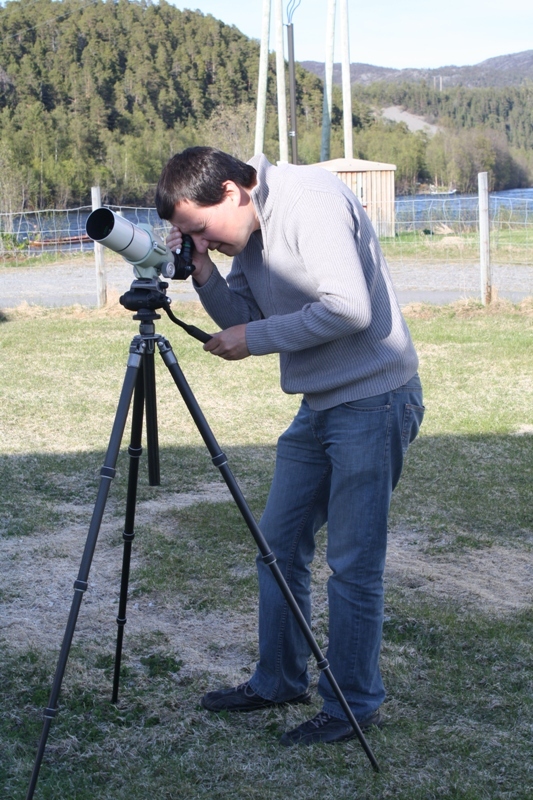 I used 20× (60mm Baby Tak) and 34× (63mm Zeiss Jena Telemator) to look for Venus when near to the Sun. Make sure the scope is exactly focused! Otherwise, any search will be futile. Use a red/orange filter to enhance contrast with the light blue sky. This also helps with the bright glare that is almost always present so close to the Sun. And finally, above all: Do not take any risk at all to make a rare observation. Otherwise, it could be your last! The transit of Venus of June 6, 2012. Chances are you missed the opportunity prior to the 2012 transit of Venus. But there is a second chance: On June 3, 2020, there’s the next inferior conjunction of Venus. The planet will be only 0° 29′ from the Sun’s center. This means, it is only 15′ from the Sun’s rim. The days preceding this event could be your opportunity to see your own extreme crescent of Venus!